Basil Essential Oil (Ocimum basilicum) is also commonly known as Sweet Basil, Thai Basil, and St. Joseph's Wort. 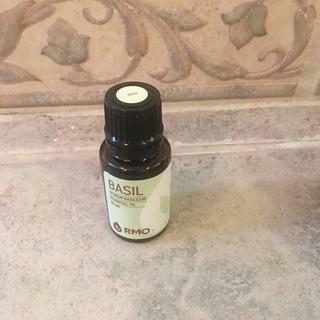 Rocky Mountain Oils’ Basil Essential Oil features an herbal, spicy, and licorice‐like aroma, presenting a middle‐top fragrance note with a faint camphorous note. Basil Essential Oil is part of the Rocky Mountain Oils Relief collection. The oil acts as a balm to help soothe skin and calm scalp discomfort. Combine the oil with rosemary, lavender, and Jojoba oil, and apply to head to promote lustrous hair. Add the licorice-scented oil to your DIY cleaning products and soaps. Try diffusing a basil blend to start your day. The strong fragrance helps stimulate and clear the mind while promoting a greater sense of overall wellbeing. Basil and Holy Basil are from two different plant species and have different chemical constituents. They can, however, be used for common purposes. The choice of which to use is usually based on aroma preference. Apply recipe to desired targeted area. Mix all ingredients together then add to a warm/hot bath and soak for 20 minutes. May be a skin irritant to sensitive skin. Dilute for topical application. Not recommended for use while pregnant. It was strong initially however when used with just a few drops blended with lime I absolutely love it ! Smells exactly like basil!! Does it’s job!! My husband and I have severe allergic reactions to juniper pollen every year. I have tried several blends that didn’t help all that much. Basil gave us both immediate relief from stuff noses and sinus congestion. It worked instantaneous and lasts a couple hours. I use a few drops with fractionated coconut oil and rub into my throat area as well as inhale several times. Unbelievable difference. So good for my headaches!! Basil, lemon and peppermint are a winning combination for my headaches and make my house smell amazing too. It's potent, so you only need one or two drops of this in the diffuser, but the smell is amazing. I am never without this oil, absolutely love it!! I also use it just for inhaling when I feel a migraine or headache coming on and it definitely helps. This smells delicious but I used a bit too much and it was overpowering. Be careful! These oils are no joke. and I use it throughout the day for the uplift. Maybe my favorite. Love this in my diffuser! A little goes a long way. One of my favorites! I did order from RMO twice so far, l am very satisfied with quality of oils and with delivery, fast, well packed, no broken bottles. Their prices are very reasonable. I am pretty sure l am going to be a regular customer. It was a great addition to my oil collection. it again once I run out of it. I am very pleased with my recent purchases! I use this oil on my knees. I put a couple of drops on each knee after a shower and my knees really like it! Not to mention how much I love the scent. This is the best company for ordering outstanding essential oils. I like that they follow their oils from seed to distillation. Great! Have yet to use it, but thus far, I love my RMOs. No complaints!!! Purchased this along with a few other oils to start my RMO collection and since have purchased more and want all that they have ! I am very happy with the company and their essential oils. This is my favorite!! I add a little lemon and diffuse. The air smells clean and fresh! I was surprised how quickly my order arrived. The quality of the rose, marjoram and birch are exceptional. Thanks for the review! If you ever have any questions or concerns regarding a product or an order don’t hesitate to reach out. Thanks! Good ! As advertised ! I was expecting to open the bottle and be greeted by the smell of fresh basil, not so much. The smell isn't unpleasant, just not as much basil-y goodness as you would experience with your head in a basil plant. When I received my shipment, the lid on the bottle of basil EO was twisted so the seal had broken and some product had leaked into the packaging. It was just a slight amount but the basil scent was very strong. The EO itself was fine and great quality. My issue was with the packaging and condition of the bottle upon receiving it, thus the three stars. May be a great oil....but it smells too much like black licorice to me. I will try holy basil. I assumed it would smell like the fresh basil in my garden. I did the read the description of the scent...figured I wouldn't need to, again, i figured basil would smell like basil...my bad!!! Basil.is just not a scent I like, but I do love rocky mountain oils! I love Rocky Mountain oils, I just don't care for the scent if the basil. I think I like the sweet, fruity smells more. since my printer doesn't work, all i asked for is papers to say what oils i bought were for. they said they wouldn't do it, not happy. Does Rocky Mountain own their own farms? If not where do they source their oil? BEST ANSWER: Our company seeks out the highest therapeutic quality essential oils to source and sell. We source oils from places all over the world where the plants can grow in their indigenous habitats. We feel that this process best cultivates the plants’ natural therapeutic properties. We do not own our own farms; we choose to work with quality farmers and distillery technicians who are experts in their fields because we are dedicated to obtaining only the purest oils that will meet our strict quality standards. Go to the website to get all the pertinent info! I love RMO for many reasons, including the quality, fragrance, and best of all it's not a 'pyramid' based organization! They sell directly to the consumer, not through a middleman, like some companies. The savings (and great sales!) go to the customer, plus free shipping! Great deal, great oils, great company! You can't go wrong, and if anything arrives damaged, etc., they'll fix it! Happy shopping! The kits are a true bargain...! Why would I choose this basil or holy basil over one another? BEST ANSWER: Basil and Holy Basil are derived from two different plants. Basil is commonly known as Sweet Basil, Thai Basil, and St. Joseph's Wort. Holy Basil is commonly known as Tulsi, Tulasi, and Thulasi. For more information, please see the descriptions on the product pages. Is this oil safe for ingestion? For recipes that require basil linalol, can I use sweet basil instead? BEST ANSWER: They are different Chemo-types so they will vary slightly in properties however they are very comparable and can be used for the same purposes.